After an ugly, albeit victorious effort over Tennessee State this past Saturday, the Vanderbilt Commodores will have a much bigger challenge ahead of them this weekend in the form of the second-ranked Georgia Bulldogs. The Commodores will take the win over TSU, but Coach Derek Mason will look for better play from his team against Georgia. The 5-0 Georgia Bulldogs are coming off a 38-12 thumping of the Tennessee Volunteers and will look to continue their quest for the College Football Playoff this week. The Bulldogs have an offense highlighted by sophomore quarterback Jake Fromm and a dynamic running attack featuring Junior Elijah Holyfield and Sophomore D’Andre Swift. Another weapon they employ, in a limited capacity, is highly touted Freshman dual threat quarterback Justin Fields. To deal with a running quarterback, Mason will urge his front seven to step up after some inconsistent performances out of the group the last few games. “Our rush lanes and ability to get the quarterback on the ground has been pretty much nonexistent [in the last few weeks],” he said. Last week, the Commodore defense allowed Tennessee State to convert 50% of their third downs and Mason knows that will not get the job done against Georgia. Vanderbilt’s leader in the secondary, safety Ladarius Wiley, commented on the defenses emphasis on third down stops this week in practice. 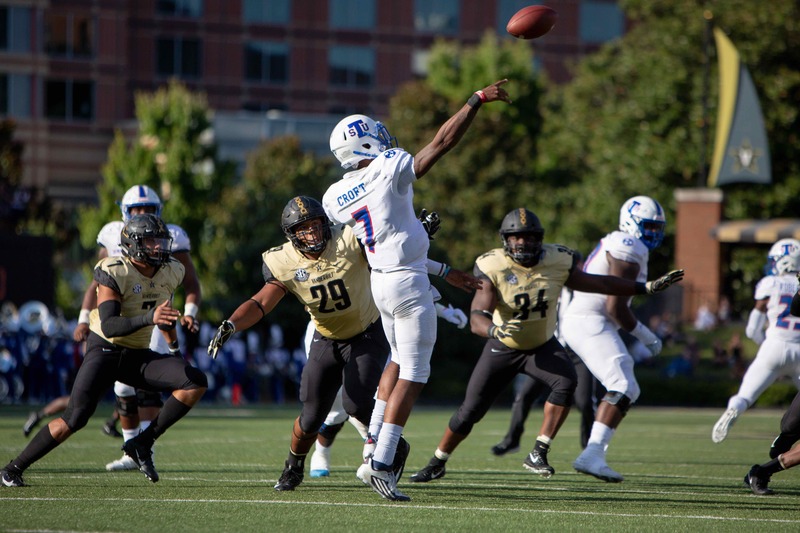 On the offensive side of the ball, Vanderbilt will continue to rely heavily on their platoon running back system and star wide receiver Kalija Lipscomb. Lipscomb has been the most consistent receiver in the SEC, ranking near the top in the country in receptions per game, receiving yards per game, and touchdowns among receivers. Mason praised his star wideout, but when asked about the stats, Lipscomb credits his team. As Saturday inches closer, Commodore fans should keep an eye on the status of key linebackers Josh Smith and Charles Wright, who have been dealing with minor injuries. Mason acknowledged these injuries, but expects younger guys to step up in the place of injured veterans if needed. A final story to watch for will be who does the kicking for Vanderbilt this weekend. Junior Ryley Guay has struggled of late, hitting just one of three attempts last week. Mason said that there has been competition this week at practice. The bottom line: Vanderbilt has a huge task ahead of them. But as pointed out by Mason, Wiley and Lipscomb, this team loves to play football and they will be excited for the challenge. Mason knows his guys will be ready emotionally, but to come out of Athens with a win, the Commodores must be ready to go from the start of the game to the final whistle.